Life on top of the world, at the Norfolk waterfront penthouse. At Harbor Heights, the customization options are endless. Your choices, your taste, your home. Tailor every square inch of this model to create a residence extraordinaire, a reflection of lifestyle and luxury. 3,100 square feet are entirely at your mercy to simplify, enhance, and otherwise make your own. 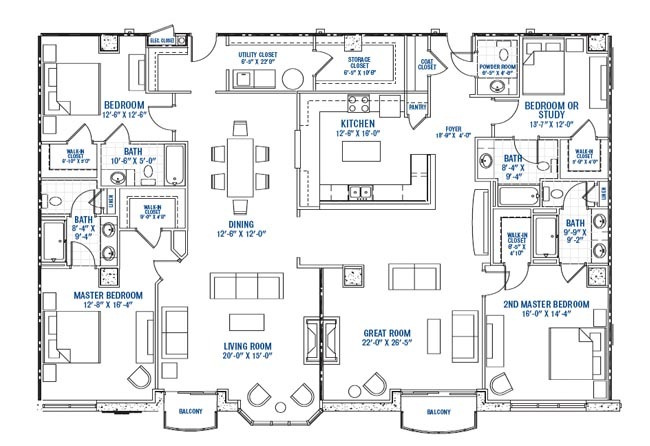 The Norfolk model offers skyline level residential luxury in the form of a 4 bedroom and 4.5 bath floor plan. Not-so-standard-features include two master bedrooms, a large gourmet kitchen, see-through fireplace nestled in the wall between the Great Room and Living Room, two private balconies and an abundance of storage space for your convenience. Make your mark on Norfolk, at Harbor Heights. Call today to schedule a tour.